The Good: 2009 Topps Heritage American Heroes is easily the deepest, most comprehensive American-themed trading card set ever produced. It offers a fresh assortment of hits that breathe some much-needed life into the concept of the memorabilia card. At only around $60 per hobby box, American Heroes features a lot of bang for the buck. The Bad: An unavoidable consequence of the depth of the 2009 Topps Heritage American Heroes checklist is that it includes many little-known subjects who have little collecting appeal. The other main issue I have is with the design of American Heroes, which mimicks the forgettable designs featured in late 1980's Topps baseball products. The Bottom Line: While not without its share of shortcomings, 2009 Topps Heritage American Heroes is a deep and immersive product that has the potential to draw a whole new audience of would-be collectors into the hobby. American History buffs, as wells as sports collectors who like to occasionally dabble in non-sports trading card products and are looking for something new, should give American Heroes a serious look. 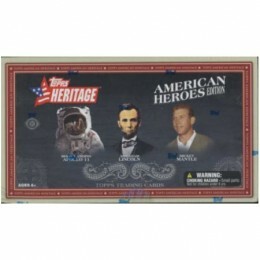 2009 Topps Heritage American Heroes was created with us budget-conscious collectors in mind. Each hobby box contains a random assortment of two hits. I ended up pulling two memorabilia cards from my box, which normally would've been a big disappointment. However, 2009 Topps Heritage American Heroes features such a refreshing array of memorabilia cards that this ended up being a good thing. In addition to its exciting checklist of potential hits, 2009 Topps Heritage American Heroes sports a healthy assortment of inserts, as well as chrome and refractor parallels. Priced at around $60 per 192-card hobby box, American Heroes offers plenty of bang for the buck. The checklist of subjects featured in 2009 Topps Heritage American Heroes is deep, to stay the least. Never before has one trading card set brought together such a wide spectrum of American heroes. From famous historical figures, political icons and sports legends to the less heralded, but equally important, law enforcement, military and medical heroes, 2009 Topps Heritage American Heroes leaves no stone of American History unturned. While this is easily one of the sets greatest strengths, the sets diversity hurts its collectibility and mainstream appeal. While the set features many well-known names such as George Washington, Ben Franklin, Thomas Jefferson, Larry Bird, Ty Cobb, Eliot Ness, and Wyatt Earp it also features an equal, if not greater, amount of little-known names that the average person will not recognize. Whether this enhances or takes away from the set is a matter of personal preference. The fact that I didn't recognize many of the names I came across in 2009 Topps Heritage American Heroes wasn't a dealbreaker for me personally as it allowed me to learn about a number of individuals that I had previously not heard of. It would've been really nice to see a larger representation of sports stars in the set. Unlike Allen and Ginter sets, which are first and foremost baseball card sets, 2009 Topps Heritage American Heroes is at its core a non-sports card set. With few exceptions, the only athletes included in the set are those who appear in the Heroes of Sport insert set. Topps American Heritage, the surprise hit of 2008, returns with an all-new American Heroes Edition featuring the most courageous, valiant, progressive and enlightened American women and men in our nation's history! BASE CARDS - 150 subjects - 8 PER PACK! Heroes of Spaceflight (25) - One of one! Heroes of Sport (10) - One of one! American Heroes (25) - One of one! Dual (10 subj/5 cards) - One of one! Hobby Exclusive! Quad (12 subj/3 cards) - One of one! Hobby Exclusive! Signature Relics (3) - One of one! Hobby Exclusive! Heroes of Spaceflight (28) - #'d to 61! Every Manned Mercury, Gemini, and Apollo Mission is represented! Eight-Piece (16 subj/2 cards) - One of one! Hobby Exclusive! INSERT CARDS - 50 subjects - 31 PER BOX! CHROME PARALLEL CARDS - 200 subjects - 5 PER BOX! I agree with most of the points in this review. 09 American Heritage was a good product through and through and would recommend it to any fans of Donruss Americana or the like. The Topps Heritage American Heroes cards of 2009 are great. Despite the fact that there are a lot of historically unknown figures on them, each of them is a great learning tool to teach about American history and historical figures. I used to have similar sets from the 1950’s which were stolen, including the presidents and “Scoops”. I learned a lot from them about history and people. Today, I’m using both Topps Heritage and Donruss Americana cards to teach my granddaughter about history. Fortunaltely I have met a few of the people on these cards and have their autographed photos. Now I’m trying to get their cards signed. For instance, Col. Bud Day is on Card No. 9, and is described as the most decorated living member of the U.S. Air Force. He was a former POW in the Hanoi Hilton after being shot down over North Vietnam. We were part of a documentary film on the Vietnam War and Jane Fonda, which appeared nationally in 1988. I never thought about asking him for his autograph as we were busy with the film. Today, with his card, I’m going to try and get him to autograph it for me. It will be a legacy gift to my son, a combat veteran of Iraq. My granddaughter will get the flown-in-space piece of cargo bay liner from the shuttle Discovery, plus the Abraham Lincoln card series. I hope that Topps does another series next year to continue telling the history of the United States and those who have made it a great nation.